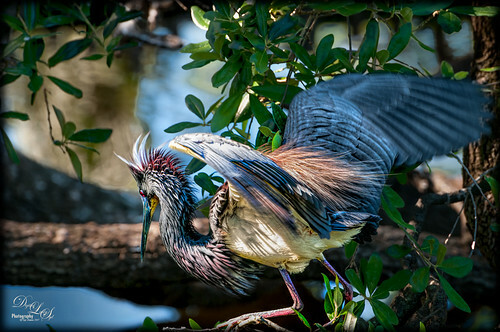 This week Topaz released an update to their very popular Clarity plug-in and it is a really nice upgrade. It is now much improved over an already excellent filter that is one of the best Photoshop plug-ins around. The Heron above was not processed very much in Lightroom, all in Clarity Topaz Studio and a little in Nik Viveza to adjust the light on the birds head and wing tip. Before going any further, please be aware that Topaz is not going to update the actual Topaz Labs version if you own it. Instead it will be updated in Studio (to download go to my Tidbits Blog sidebar and for more info check out my see my Introducing the Free Topaz Studio blog) before adding the Clarity update. If you have Studio already running, just go to the website to find the Clarity update by clicking this link. Topaz does a great job of walking you through this new process on the Topaz Studio website. So what is so different? It is all in the Clarity Interface. In Photoshop, the new Clarity update will now be linked as Clarity in Topaz Studio (Filters -> Topaz Studio -> Clarity) instead of in the regular Topaz Labs individual plug-ins. 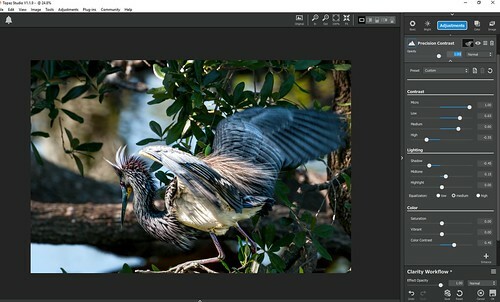 By selecting Clarity, an interface very similar to Topaz Studio will appear that contains two adjustments, Precision Control and HSL Color Tuning. See image below for an example of the bird as it looked in Clarity for Studio (click to see large view Flickr). As you can see the Clarity Dynamics section from the Topaz Labs Clarity plug-in is now called the Precision Control Adjustment. 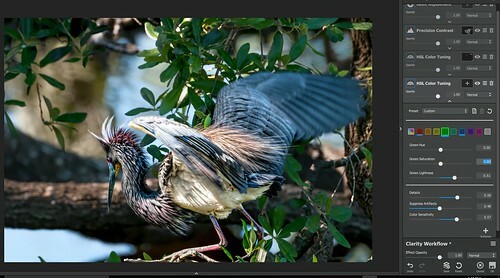 The Contrast section contains the original Micro, Low, Medium and High Contrast sliders but the website says they are now much improved – I believe they are after using the update on the bird image. Some of the feathers on the bird are crazy sharp! The Lighting section sliders are better at detecting the Shadows, Midtones and Highlights – these appear to be derived from the original Toning Section Black Level, Midtones, and White Levels sliders. Also there are Equalization buttons (low, medium, or high) which are supposed to emulate the Region technology in Topaz Adjust. I have not fully explored this. The Preset drop-down has several choices for setting up these sliders (Balance, Brighter, Brightness, Color Detail, Color Boost, Details, HDR, Little Things, Reduce Shadows, Saturation Boost, and Sharp). This image shows settings for the Color Detail preset. There are also presets on the left side which I did not use for this image. All your original Clarity presets are migrated over. Unfortunately at this time there are no subcategories so one long list of presets occurs – I cannot seem to figure out a logical order to them and my personal presets are all over the place. The good news is that there is a field for searching for your presets if you can remember what you named them. Hopefully Topaz will address this situation in a future update. The second part of the original Clarity was called Hue/Sat/Lum and now is called HSL Color Tuning. Not a lot different other than each color has individual sliders where the color is shown in the image, and a Gray Color is available. Also some presets are in a drop-down (Extreme Hue I and II, Increase Cool, Increase Warm, Red Cool, Red Warm, Subtle Hue I and II). Three new sliders have been added: Details (to help recover detail lost from increasing the brightness of the different color or whole image), Suppress Artifacts (to remove rough and unnatural edges and helps reduce artifacts to reduce detail), and Color Sensitivity (set higher to add saturation in the whites and grays in surrounding image). Not sure I understand how these setting work exactly yet, but the website does a good job of telling what they do. By using the Studio interface, each adjustment can be masked, different blend modes applied, and opacity adjusted. So there really is a major benefit to using the upgraded version in Clarity for Studio. In the screenshot below, you can see the Precision Control mask created for this image. I did not want the background to appear crisp, so by clicking on the plus sign on the upper right of the adjustment, a layer mask is opened. I inverted it and used the Brush tool to just paint back the bird. The brush tool has really been improved – it does not crash my system if too many strokes are made too quickly. Two HSL Color Tuning Adjustments were used: One to change the green color in the upper right corner (a layer mask was used to localize the color change), and one to emphasize the Red, Green and Blue colors, and adjust the Details, Suppress Artifacts and Color Sensitivity sliders. See screen shot below. If you bought the Pro Adjustments pack from Topaz Studio, the Clarity updated sliders will also be in the Precision Contrast and HSL Color Tuning adjustments in Topaz Studio. If using the stand alone version of Topaz Studio, I do not see at this time a specific link to the Clarity for Studio update in the menu for those who previously owned Topaz Labs Clarity. I believe the two Adjustments will just be added to the regular Topaz Studio interface. Note that you can still reach the original Topaz Labs Clarity plug-in (and all your other plug-ins) in both the stand-alone version and the Photoshop Filter version by going to the Plug-ins in the top options menu of either Clarity for Studio or the Topaz Studio interfaces. 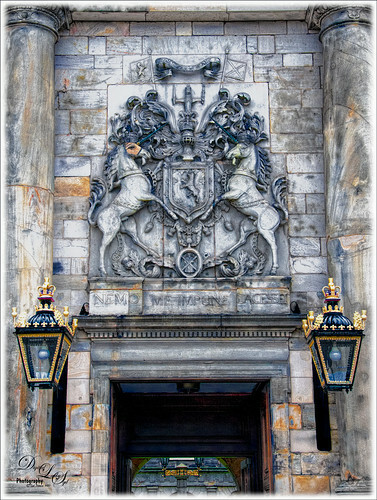 The image above is from Holyrood Palace in Edinburgh, Scotland. The Clarity in Studio did a great job on the detail of the stone carvings. A Dodge and Burn 50% gray layer was added to finish up, but Clarity did most of the detail work in this image. It also does a great job on landscapes so give that a try too. 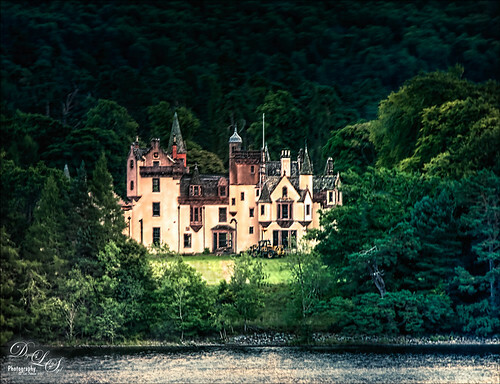 Below is a house located in the Scottish Highland and is probably a little over the top with processing, but I like the almost illustrative artsy effect. Instead of using the HSL Color Tuning Adjustment, the Dehaze Adjustment from the Pro pack was used to make the tree colors sharper – a preset was made in the Community called SJ Clarity PC with Dehaze that you can download to try out the settings. Then I also added one of my favorite Topaz plug-ins, Detail 3, and set the Med Detail to 0.38, Large Detail to 0.15 and Tone Contrast to 0.30 set to 59% layer opacity. That was about it. The combination of Clarity and Detail is one I actually use quite a bit when I want this type of look. This entry was posted on 09/02/2017 by sydspix. It was filed under Photoshop Filter and was tagged with Clarity in Topaz Studio, Topaz Detail 3, Topaz Studio. Looks awesome. I have Fx Lab but I am thinking I should get Studio. The basic Studio is free so if you own the Clarity plug-in already, it can be added right in. I think if you are a Topaz owner, you almost have to at least put the Studio on your computer as a PS plug-in so you can get all the new updates of their original filters. Syd these are gorgeous! I installed Topaz at the end of a very long day of installing apps and having all kinds of problems. I’ll have to read this blog when I don’t have a splitting headache. But Topaz is way easier to access from Lr. The bird looks fantastic. What a great tool!